Girls With Guns, Promotions And More! Make sure you check out the winner stories at Casino Action to hear how perseverance can really pay off, take advantage of the double points promotion on Battlestar Galactica for the whole of March too. And check out the new game, Girls with Guns! Let’s start with the Battlestar Galactica promotion. Do you know this fairly new video slot? Amazing graphics, exciting sound effects, epic gameplay and enormous jackpots – it’s no wonder this slot is one of the most popular games at the casino. Everyone loves the variety in game modes, with different characteristics which award additional wins. The ‘Ion Storm’ feature can turn up to 5 reels wild and also trigger some exclusive video footage from the original tv series. 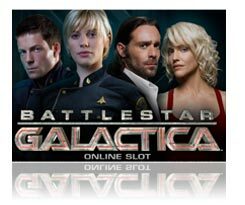 Play Battlestar Galactica this month and you will be credited with double points. Also introducing brand new, Girls with Guns: 6 of the sexiest soldiers you’re ever likely to meet, in this exciting 243 Ways to Win video slot with style and attitude! Mixing mascara with machetes and lipstick with landmines, join this band of crack commando super vixens as they attempt to defeat Hector the drug baron and recover a treasure trove of gold to share with you. From the opening intro video, the artwork, animation, widescreen resolution and sound effects in this brand new game are outstanding, creating a high level of entertainment and immersion. Girls With Guns has no pay-line constraints and instead offers up to 243 ways to win. Symbols need simply to be aligned left to right anywhere on the reels to win, and there are up to 243 winning combinations, each allowing the player to create more opportunities to profit. The game was launched 6 March 2013 on all Microgaming casinos. Breaking News At Omni Casino!